Curd is something that I love eating to strengthen my gut. Curd, when used as a face mask, delivers impressive results. I include curd based face masks atleast once a week. 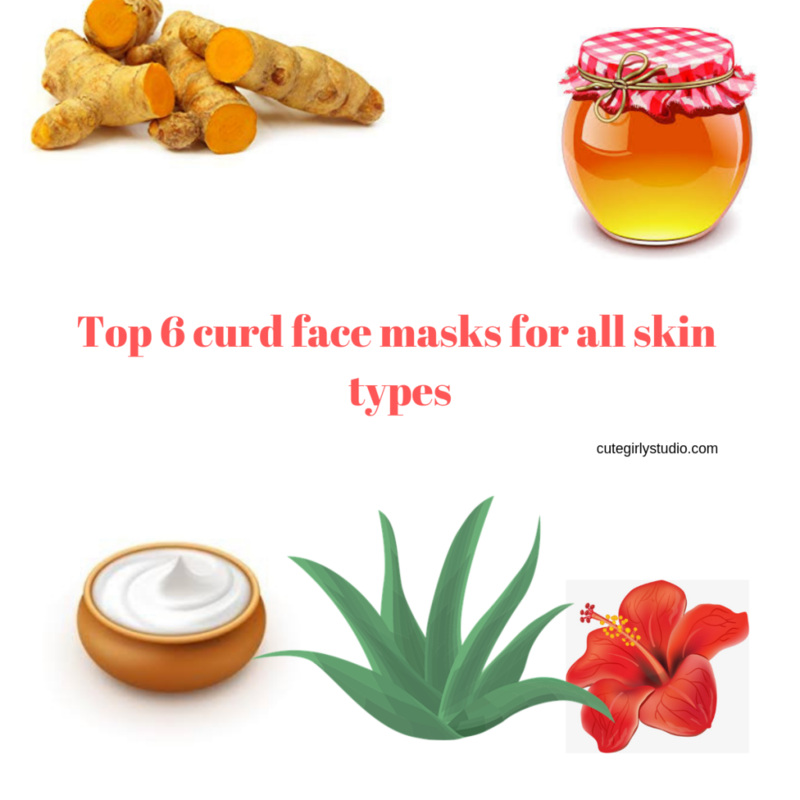 I have listed my top favourite curd face masks in this post. My skin turns dry and dehydrated during winters and this face mask is my go-to face mask in winters. It’s easy peasy and at the same time effective in treating dry patches. Mix rose petal powder (if using), curd and banana in a bowl and apply it all over your cleansed face and neck. Leave it for about 15 minutes and then rinse your face. It leaves your skin soft and moisturized instantly. If your skin is tired or needs some TLC then you must give this face mask a try. It makes your skin feel alive and fresh. This face mask also lightens recent tan and acne marks. Mix wild turmeric powder and curd in a bowl and apply it all over your cleansed face and neck. Leave it for about 10 minutes and then rinse your face. Use this face mask continuously for 5 days, your skin will feel alive and rejuvenated. Summers comes with sunburn and tan. Curd is one of the amazing ingredients to soothe sunburn. Mix cucumber juice (If using), Aloe vera gel and curd in a bowl and apply it all over the sunburned skin. Leave it for about 10 minutes and then rinse the mask. It helps to soothe sunburn. Curd has property to lighten spots and tan when combined with the right ingredients. It also helps to hydrate and nourish the skin which is vital in maintaining the health of the skin. Mix liquorice powder, honey and curd in a bowl and apply it all over your cleansed face and neck. Leave it for about 10 minutes and then rinse your face. Use this face mask on alternate days to notice the difference. Hibiscus, when combined with curd, helps to tighten the skin and at the same time improves the health of the skin. Mix Hibiscus petal powder and curd in a bowl and apply it all over your cleansed face and neck. Leave it for about 10 minutes and then rinse your face. Using this mask regularly will tighten the skin. Curd, when used with the right ingredient, works well for oily skin. Oily skinned beauties can benefit from curd by using the following face mask. Mix Clay, gram flour and curd in a bowl and apply it all over your cleansed face and neck. Leave it for about 10 minutes and then rinse your face. Using this balanced face mask twice a week will work amazingly on oily skin. It brightens the skin without stimulating sebaceous glands. These facemasks might look simple but when used regularly will keep your skin healthy and nourished. After all, consistency is the key to achieve flawless skin. That’s all for today’s post guys.